The World Almanac® and Book of Facts is America's top-selling reference book of all time, with more than 82 million copies sold. For more than 150 years, this compendium of information has been the authoritative source for all your entertainment, reference, and learning needs. The 2019 edition of The World Almanac reviews the events of 2018 and will be your go-to source for questions on any topic in the upcoming year. Praised as a "treasure trove of political, economic, scientific and educational statistics and information" by The Wall Street Journal, The World Almanac and Book of Facts will answer all of your trivia needs on demand—from history and sports to geography, pop culture, and much more. The World at a Glance: This annual feature of The World Almanac provides a quick look at the surprising stats and curious facts that define the changing world and includes a sneak peek at upcoming milestone celebrity birthdays in 2019. Statistical Spotlight: A popular annual graphic feature highlights statistics relevant to the biggest news of the year. These data visualizations provide important context and new perspectives to give readers a fresh angle on important issues. 2018 Election Results: The World Almanac provides a comprehensive look at the entire 2018 election process, including complete Election Day results for House, Senate, and gubernatorial races. World Almanac Editors' Picks: Senior Moments: With sports stars like Tom Brady and Serena Williams approaching middle age while still at the top of their game, The World Almanac editors look at the sports world's most memorable achievements by aging athletes. The Year in Review: The World Almanac takes a look back at 2018 while providing all the information you'll need in 2019. 2018—Top 10 News Topics: The editors of The World Almanac list the top stories that held the world's attention in 2018, covering the U.S. Supreme Court nomination process, historic negotiations with North Korea, a year of #MeToo developments, and much more. 2018—Year in Sports: Hundreds of pages of trivia and statistics that are essential for any sports fan, featuring complete coverage of the Winter Olympic Games in South Korea, World Cup men's soccer, the World Series, and improved MLB player stats. 2018—Year in Pictures: Striking full-color images from around the world covering news, entertainment, science, and sports. 2018—Offbeat News Stories: The World Almanac editors select some of the most unusual news stories of the year, from the parade commemorating a team’s winless NFL season to the “bananas” lawsuit over a Halloween costume. World Almanac Editors' Picks: Time Capsule: The World Almanac lists the items that most came to symbolize the year 2018 in news, sports, and pop culture. Other New Highlights: Brand-new statistics on crime rates for all major U.S. cities, U.S. trade and immigration policies, 2018 tax cuts, DACA recipients, mobile app and tech usage, student loan debt, income inequality, and much more. Black-and-white photographs. Three full-color inserts. Index. 1,008 pp. 7 1/4 x 10 1/4. 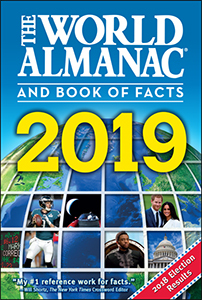 "Exceptionally well organized and [presented], The World Almanac and Book of Facts 2019 is an essential addition to school and community library collections."